Washington (CNN) – When Secretary of State Hillary Clinton left the State Department earlier this year, she told reporters that she would be "stepping off the very fast track for a little while." That time away, however, appears to be over, as Clinton hits the gas with a two-day, five-event whirlwind trip to California this weekend. The former Secretary of State will travel to Los Angeles and San Francisco on Friday and Saturday in a blitz that combines a corporate speaking engagement, an event for the Clinton Foundation and two award events where she will be recognized for her work at State. On Friday night, Clinton will be honored with the "Global Champion Award" by International Medical Corps, a philanthropic group that helps respond to natural disasters with manpower and money. The group said it is honoring Clinton because of her "profound dedication to advancing human dignity, particularly for women and children." "She has actually been a longtime supporter of our work," Margaret Aguirre, spokeswoman for the group, said. "She visited our programs in the Congo. She has been a big supporter of our work with women and children. She has been really a champion of the work that we do for about going on 15 years." The event is being held at the posh Beverly Wilshire Hotel in Beverly Hills and Aguirre told CNN that the room is already sold out. Upwards of 880 people paid at least $500 for a ticket, she said. Also on Friday, Clinton is reportedly headlining a discussion put on by the Producers Guild of America. The discussion, which the Hollywood Reporter says is being moderated by Rob Reiner, will center on early childhood education and voluntary national service and will bring together a "small group of TV execs, writers and showrunners to help plug the initiatives." In her 2008 race against Barack Obama, Hollywood–and its money–largely broke for her Democratic challenger. With Clinton eyeing a repeat bid for the White House in 2016, her time rubbing elbows with producers and television executives is bound to spark speculation she is already courting California's big money donors. Clinton will remain in Los Angeles for part of Saturday, when she is honored at a brunch put on by the Mexican American Leadership Initiative. Clinton will be receiving the "Hermandad Award," which is presented to someone who works to "enhance opportunity for the people of Mexico and the health and prosperity of the two nations." Zuraya Tapia, spokeswoman for the initiative, said the group choose to honor Clinton because of her work with Mexican Americans, particularly because of her focus on development in Mexico during her time at the State Department. Clinton will travel to San Francisco later that day where she will deliver the keynote address at the National Association of Realtor's annual meeting. The event has been closed to the press, as is true with other paid speaking engagements by Clinton. The event was closed to the press "per Clinton’s speaking agreement" with the group, said Sara Wiskerchen, a spokeswoman for the group. Shortly after leaving her State Department post, Clinton signed on with the Harry Walker Agency as her representative for speaking engagements. She is a highly sought speaker who likely earns in the six-figure range per appearance. Her address to the realtors group is just the latest of a string of speeches she’s given since leaving the State Department. Her first outing was in April when Clinton addressed the National Multi Housing Council in Dallas. Later Saturday, Clinton and daughter Chelsea will attend the Millennium Network San Francisco event, put on by the family's Clinton Foundation. The Clinton Foundation says the event is an effort by Hillary and Chelsea Clinton to "inspire and encourage the next generation to address global challenges, and invite future leaders and philanthropists to get involved in the work of the Clinton Foundation." Also in attendance, according to the foundation website, will be a cadre of top flight television stars. Patrick Dempsey, of ABC's "Grey's Anatomy" fame, is a featured guest, as is Rashida Jones, known for her role on NBC's "Parks and Recreation." Blue Traveler, a rock band that gained fame in the 90s, will provide music for the night. The event is nearly sold out, according to the website. Bullock – when did you get out? Welcome back. Tiffin – kind of obsessed with looks aren't you? You must really be a good looking wingnut. California is proud to be a blue state. Hillary can count on getting all of California's electoral votes. She can also raise a lot of cash in the San Francisco Bay Area and Hollywood. Do we really need another Clinton in the White House? The Clinton years in the White House were some of the best years for our country. Their return is eagerly awaited by many. The country now is NOT better than it was under the Clinton administration. Go Hillary!!! she is an accessory to murder. she belongs in jail. she needs to be followed to all of these events and heckled about her lies about benghazi. what difference does it make!??? if it was her duaghter that died there, would it then make a difference? or were those 4 american just expendable? collateral damage to hillary clinton's incompetence. 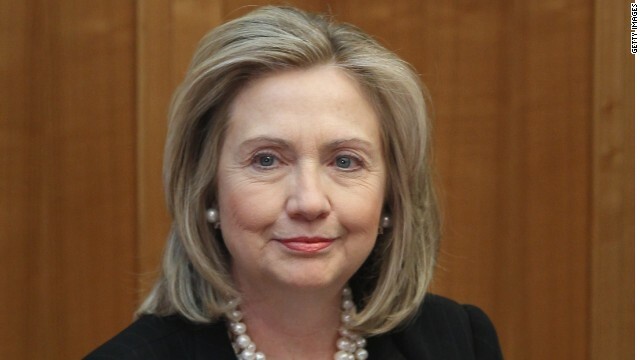 Billary – A face that only a mother could love... No wonder Bill went cigar shopping. Palin, a face and voice only an inbred hick would love. No wonder Todd is rarely seen in public with her: must be part of their common-law marriage vows.